Playing with fun food is our favorite way to craft, and a terrific healthy snack! When craft time can double as snack time not only can kids express their creativity, but they get excited about eating what they made. 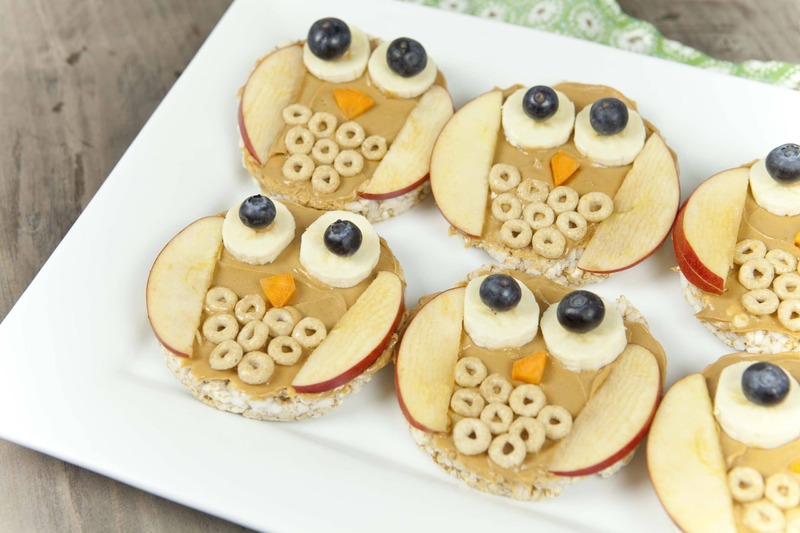 That’s one reason we love this owl snack. 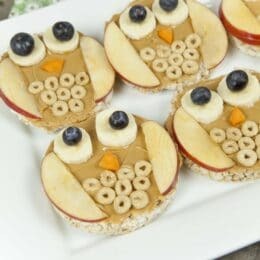 One of the first blog posts I ever wrote included an owl snack, 8 years ago! It’s so funny, that I still think owls are fun to make. But how can you not craft owls, when they are so simple and so cute! What healthy snacks fill you up? Feeding our kids snacks is second nature. They get hungry often because their little stomachs just aren’t that big. However, sometimes, a snack can satisfy a kids appetite for a moment, only to leave them hungry an hour later. The key is not just to look at the volume of the snack, but also what the snacks are made of. A snack that fills you up in the moment, but also for several hours will have a combination of fiber (for volume), fat (for satisfaction), carbs (for energy), and protein (for building). When all these are present in a snack, I can guarantee those kids will be satisfied with their snack. Some of our favorite foods that meet this requirement are peanut butter (or other nut butters) and fruit. The fruit contains the fiber that is filling and the carbs that provide the energy. The nut butters give the fat and protein. These owl snacks are a great fit for the perfect healthy snack. Also, this peanut butter dip that we take to parties with fruit all the time! When to eat healthy snacks? As adults, it’s hard to tune into our hunger signals. The hunger signals have been ignored for so long, and we’ve been influenced by tempting, calorie dense, hyper-palatable food, that we aren’t really hungry for to begin with. 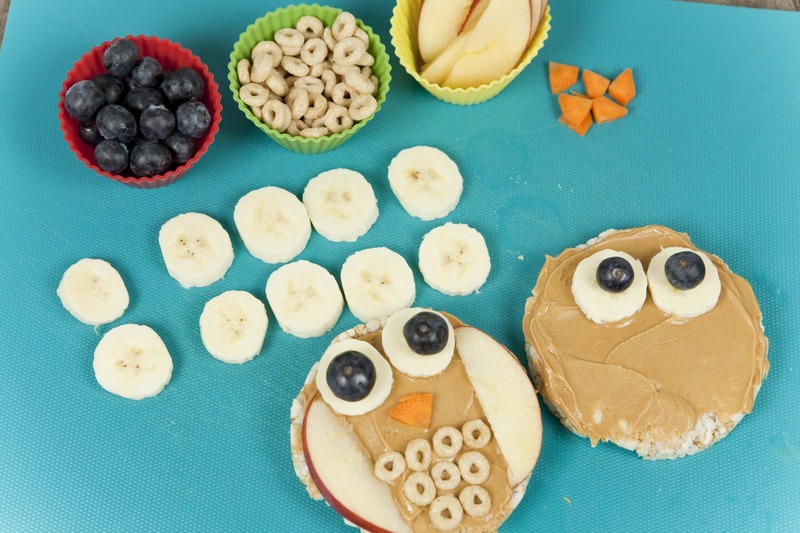 Kids are in a better position to know when they are truly hungry, and if we can respond appropriately, we can help them reinforce the perfect timing for their snacks. If a child is eating a healthy breakfast, and a smart lunch, generally in between lunch and dinner, we make time for a snack… about 3:00! 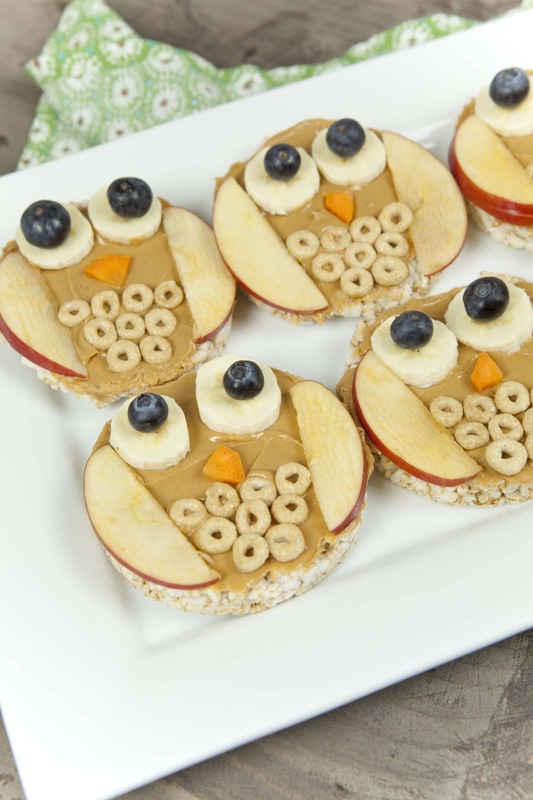 This owl snack includes a base of a rice cake with a peanut butter spread. Then, we included apples, banana, blueberries, and some cereal! Let the kids arrange the toppings in any way they like. I find it helpful to share a picture from this post so they can get a general idea of how to make it look like an owl, without taking away their own creativity. How much should you eat at a snack? A snack doesn’t need to leave you stuffed! No meal needs to do that. If you can assess your hunger before and after a snack, and truly be mindful of it, you can determine how hungry you are on a scale. If 1 on the scale is STARVING, and a 10 is STUFFED. Our goal with snacks is to leave you at a 6! You aren’t starving anymore, but you aren’t stuffed either. To eat to a 6 takes practice, attention, and mindfulness, but it’s so worth it. Lay out rice cakes on a baking sheet (this will keep the mess in one area). Slice banana and set aside. Spread peanut butter over each rice cake and then place 2 slices of banana towards the upper part of each of the rice cakes. This will serve as your owl’s eyes. 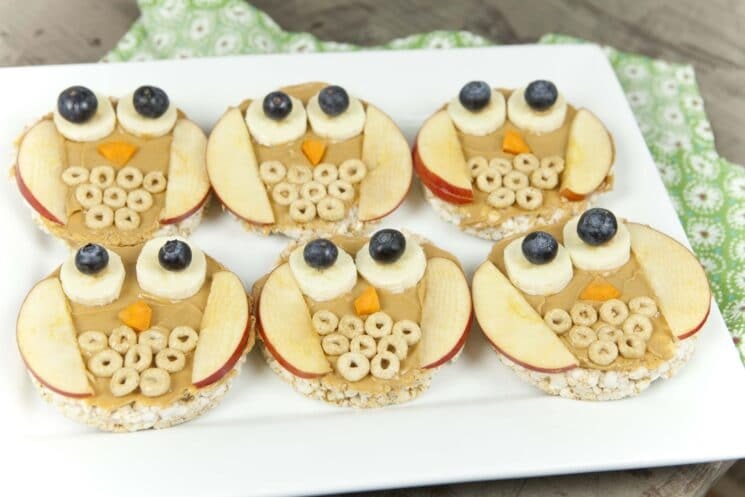 Dab a small amount of peanut butter on the center of the owls eyes and add a blueberry for the pupil of the eye. Slice apple in half and then slice the halves into very thin wedges (1/8 inch thick). Place 2 onto each rice cake, (peel side outward) to serve as the owl’s wings. Peel carrot and slice thinly. Using 4 slices, cut into triangles for the nose. Finally, add some cheerios for feathers between the wings. 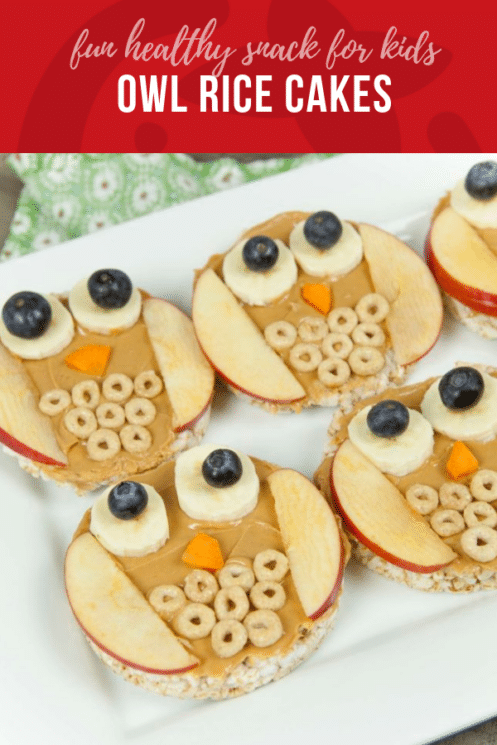 Tried this recipe?Mention @SuperHealthyKids or tag #SuperHealthyKids! Did you make this recipe? Leave a review! I'm a mom and registered dietitian with a passion to help parents create a home environment where they can raise healthy kids! Get family-friendly recipes, picky-eater strategies, lunch-packing tips and more, delivered each week to your inbox.